These creatures know how to stick together. The talented developers at ZeptoLab face the same challenge as Angry Birds creator Rovio Entertainment, that being the task of convincing people that it's more than a one-hit wonder. Cut the Rope was a huge success, and if ZeptoLab continued to churn out sequels, we'd like to think the rest of the world would applaud. It's clear, however, that the team aspires to achieve something more, which is why the company took a break from OmNom to release Pudding Monsters for iOS and Android. 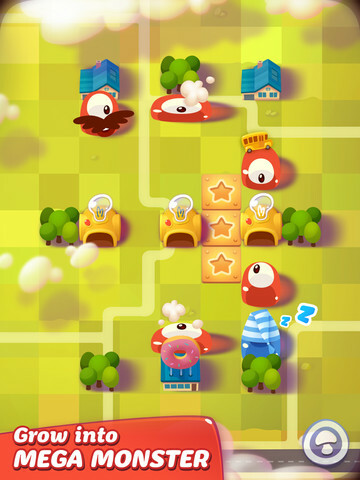 Both adorable and tricky, the game presents users with 75 stages filled with cute blob-like creatures. The goal is to find ways to stick them all together with carefully thought-out finger swipes. The challenge comes from collecting three gold stars per level, easily viewed on each board, and obtained by covering them all with blobs. Not exactly child's play when swiping in the wrong direction sends characters flying off screen, forcing you to restart. There's also the possibility of making permanent and decidedly wrong maneuvers. ZeptoLab offers an assist via objects on the board that prevent a blob's demise, like wood that stops a creature in its tracks, or ice that breaks upon impact. You'll even come across different character types, like the green blobs that leave behind a sticky residue that ensnares their buddies, or the purple blobs that move at the same time, despite occupying different parts of the screen. The fact that the game lacks a constantly ticking clock means you can obsess over solutions for as long as you wish. There's no denying the enjoyment that comes from figuring things out, and it wouldn't surprise us to see blob plush toys in 2013. 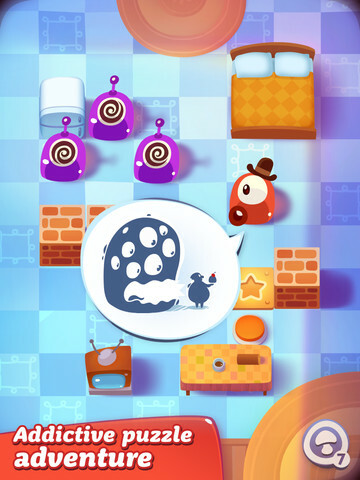 The game has a cute presentation highlighted with cartoon-style graphics and cheery music, though to be fair, the blobs don't have the same appeal as Cut the Rope's OmNom, or its complexity, for that matter. The aforementioned puzzler forces players to think things through, with each snip of a rope having a dramatic effect. Here, gamers can easily breeze through stages with simple trial and error, seeing everything Pudding Monsters has to offer in two hours or less; to be fair, more levels are on the way. That Pudding Monsters fails to match Cut the Rope's brilliance is no surprise, not when the title it followed is one of the finest smartphone and tablet games in history. Much like Rovio's Amazing Alex, it's a quality effort that cements ZeptoLab as one of the more talented iOS and Android developers, a studio that'll likely entertain us for years to come. Review code provided by ZeptoLab. What's Hot: Blobs with personality, cool stick-together gameplay, cartoon quality graphics, 75 levels to master. What's Not: Easy puzzles, you can beat the game in a couple hours.